A new detector that measures ultra-high ammonia concentrations – from 10,000 to 1 million ppm (saturated) – has been developed by Minneapolis based Sensor Electronics. Ammonia (NH3) is both toxic and explosive, meaning leaks from pressurized vessels can be especially hazardous. Conventional electrochemical ammonia detectors give reliable readings to, say, 1000 ppm. Problem is that they don’t respond at higher ammonia levels, Moreover, they have a short working life – to typically only a year or two – meaning periodic testing, regular replacement. In contrast, this new detector works in the long infrared spectrum, meaning extreme accuracy, excellent repeatability, and an operating life measured in decades. The detector is engineered for use in power plants, research laboratories, process controls, medical equipment manufacture, fertilizer compounding, commercial refrigeration systems, and the life. 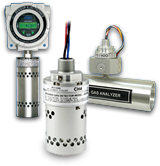 This fail-safe detector shrugs off corrosive atmospheres; rugged components are immune to sudden shock, continual vibration, electromagnetic interference, temperature/humidity extremes (-40/140 degrees Fahrenheit, 095 per cent RH). 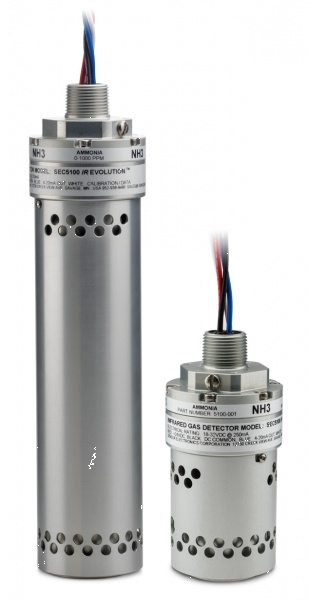 Detectors can tie into existing control/security networks, or as a stand-alone, work in with dedicated transmitters that show real-time ammonia concentrations on digital readouts: color coded alarm lights can warn of leaks, dangerous levels, possible product contamination.